October 15th is the first day of open enrollment for Medicare. If you are like me, age 55, you probably are not worried about it. But did you know that for a program that has been around since 1965, there is constantly a lot of confusion around this federal benefit that significantly impacts your parents’ financial decisions, and the sooner you learn more about it, the better position you will be able to help your parents as well as yourself down the road. We’ll discuss this topic on Day 10 of the 30 Day Preparation Plan To Care For An Aging Parent. Welcome to the Raising ‘Rents Podcast. This show is sponsored by ComForCare, a national home care provider that will help you live your best life possible. Day 10 of the 30 Day Preparation Plan is the next step in preparing a plan to become a caregiver. Keep in mind as we go throughout this process that our primary goal for family caregiving, regardless of circumstances, is to provide a loved one with a comfortable, caring environment in which to grow old. I was at an education program recently hosted by a local caregiver coalition support group that talked about Medicare. I was initially not going to go because I still have 10 years to worry about it being that I am only 55 and you don’t receive the benefit until you turn 65. But after the session which was given by Dan Katzeff who has a company named The MedigapAdvisor, I was really glad I attended because not only was there information for me to think about before I turn 65, but there were a lot of questions from the audience who were caregivers like you and me as well as older adults like our aging parents. The topic is very confusing. People confuse Medicare with Medicaid, Medicare enrollment with Obamacare, and some think Medicare alone is enough to take care of all medical expenses. The most important takeaway from listening to Dan Katzeff’s discussion and from a great podcast that I subscribe to called Medicare Nation by Diane Daniels, another Medicare specialist, is that a big part of retirement planning for you and your parents is preparing for and managing healthcare costs. Medicare planning plays a big role in that once you turn 65. I am not about to give you an in-depth review of Medicare. I will leave that to the experts. But what I will do is provide you enough to think about, and a few resources to go to and learn more. By the way, there are a lot of experts out there like Dan Katzeff and Diane Daniels who primarily handle long term planning for health care costs and will regardless if you use their services and products or not can assist you with questions on Medicare. One thing I will share with my listeners who most are not yet Medicare recipients, be sure to enroll when your time comes. Medicare does not give you official notice and unless you’re already receiving Social Security retirement or disability benefits, you must apply for Medicare when it is time to enroll otherwise you will face penalties. First the easy nut to crack. The difference between Medicaid and Medicare. Medicare cares for people who need “Medical Care”. Medicaid helps people who “qualify” as needing “aid” to financially pay for care. Medicare is a federally provided health insurance program that in 2015 insured more than 55 million people – most over the age of 65 but does include individuals with disabilities under the age of 65. Medicaid is designed to help people regardless of age in need of financial assistance (aid) for medical and/or long-term care expenses. Each state administers its own Medicaid program – which means the rules and benefits often vary from state to state. Okay, next, the not so easy nut to crack—breaking down the parts to Medicare. Let me attempt it. And I referred to a recent article by Trisha Phillips “9 Questions You Should Be Asking About Medicare” found on a blog called “Money & Career Cheat Sheet”. 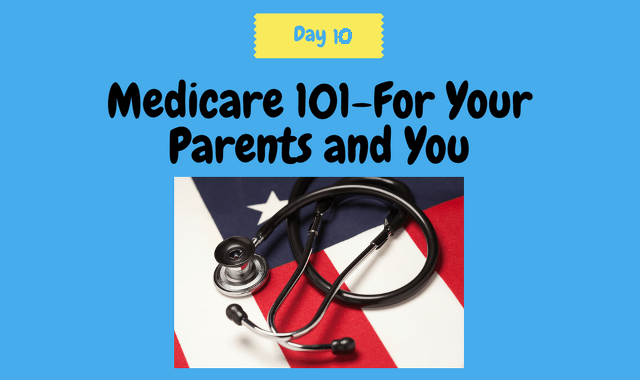 There are four main parts to Medicare – Part A, B, C and D. And then there is Medigap. Part A is hospital insurance which covers a range of inpatient hospital care and some in-home care usually associated with a hospital discharge, and some hospice care. Part B is coverage for things outside the hospital like outpatient care, doctor visits and services, preventative screenings, and diagnostic tests, medical equipment and supplies. Parts A and B go hand in hand and are often called “Original Medicare”. They do not cover prescription drugs. Let me repeat that because this is widely confused. The Original Medicare Plan, Parts A and B, does not cover drug costs. That is covered by you and your parents. Part C also known as Medicare Advantage is a private company that contracts with Medicare to provide both Part A and Part B and most plans offer prescription drug coverage. The plans are often HMOs or PPOs. Part D is a prescription drug coverage plan. Part D allows seniors to have some form of insurance coverage that will enable them to get their prescription drugs at an affordable rate. Part D is handled by a private insurance company that is approved by Medicare. Because Part D is run through private insurance companies, you’ll find various options and levels of coverage, depending on the company you choose. It is suggested that those relying on Part D during retirement would be wise to explore a Medigap policy to plug the holes in the Part D program. Medigap is a supplemental Medicare insurance. The purpose of Medigap is to offset the costs when certain portions of care aren’t covered, including deductibles, co-pays, and other unforeseen costs associated with health care. It’s sold through a private insurance company to help fill in the “gap” in Medicare’s costs. Like Medicare, it will only cover one beneficiary, not their spouse. Medigap policies are regulated by the government to protect the consumer and they are “standardized” by the insurance company so that you may make an “apples to apples” comparison. Medigap premiums obviously vary based on the plan you choose, and also by the insurance carrier. Though Medigap D will have the same coverage amongst all companies there can be a big difference in premiums so it’s wise to shop around. Some companies offer additional coverage for items that are not covered by Medicare, such as hearing aids. What does Medicare cost? It is not free. In 2010, the out-of-pocket expenses averaged around $4,734 for all Medicare beneficiaries, according to Kaiser Family Foundation. This includes premiums paid. Unlike the private insurance plans you are accustomed to, Medicare B is taken by almost every doctor—90% accept medicate. So that is convenient. For current rates, you can refer to the Medicare site for details. Coinsurance:The percentage of the cost that you pay for a medical service or equipment. For example, for many Part B services, Medicare pays 80 percent of the cost; your coinsurance in those cases is 20 percent. Copay: A specific dollar amount that you pay as your share of the cost of a medical service or equipment. For example, in a Medicare Advantage plan, you might have a $25 copay for a doctor visit; under Part D, you might have $10 co-pay for a particular prescription each time you get a refill. Deductible: The amount you must pay before insurance pays anything. For example, the Part B deductible in 2017 was $183; that means you must pay for the first $183 in expenses that fall under Part B before it will begin covering costs. The drug plan is a little confusing. The government requires certain minimums for the Part D plan, the drug plan. In 2011, the lowest premium was around $30 per month, with Initial Deductibles around $310 before your drug plan pays a dime. Once the $310 deductible has been reached, Part D picks up the tab on 75% of the prescription drugs for seniors until their total costs for the year reach another amount set by the government. In 2018, it will be $3750. Once the total drug costs for the year reach $3750, there is a period of essentially non-coverage known as the donut hole. You pay 100% of the drug expenses up to a total of $5000. Some provisions have been put in place to help with the costs such as a 50% discount on brand name prescription medications for those who fall within this benefit gap. This donut hole is essentially being phased out by 2020 per the Affordable Care Act. What does Medicare cover? It covers a wide range of medical services (including expensive ones like organ transplants), prescription drugs, and medical equipment. But there are gaps, such as coverage for routine vision, hearing, and dental care. And Medicare doesn’t cover the non-medical costs of long-term care in nursing homes and assisted-living facilities. AARP on their website shares some tips on helping you determine what your optimal insurance mix might be. Medicare Advantage (Part C) is a one-stop shop — there is no need to get separate drug or supplemental policies in most Part C plans. Some plans cover dental, vision and hearing. A primary care physician may coordinate your overall health care needs. Plans typically have lower cost sharing than original Medicare. Some things to be cautious about are you may pay more for going to doctors or health care centers out of network, you may need referrals to see specialists, if your plan leaves the area or shuts down, you have to choose new coverage, some plans charge an additional premium above the standard Part B premium and plans are difficult to compare, as no two are the same. Supplemental Insurance (Medigap) covers some or most out-of-pocket expenses that parts A and B don’t, including hospital deductibles and 20 percent doctor-visit coinsurance, you are guaranteed coverage during the initial enrollment period, even if you have a preexisting condition, coverage is then guaranteed renewable, as long as you pay your premiums. As with original Medicare, coverage is nationwide. Plans are standardized by the federal government, making them easy to compare. Things to be cautious about are average premiums are more than $2,000 a year, once enrolled, it may not be easy to switch plans, If you don’t sign up during the initial enrollment period, plans can deny coverage or charge higher rates, there is no prescription drug coverage, so you still have to enroll in a Part D plan. So that’s Day 10. Join us for Day 11 as we talk about estate planning that will also help prepare for healthcare costs during retirement. Thank you for listening to the Raising ‘Rents podcast. This was Episode 19. If you have any questions or feedback, please go to our website www.raisingrents.com and click on the “Contact” tab. You can also find the show notes and references to anything we talked about. Until we talk again, remember that our parents raised us, the least we can do is help raise them. Talk to you later.